The man widely regarded as one of the ‘fathers of the Internet’, Vint Cerf, is currently on a ‘working holiday’ in Australia where, in his current role as Google’s Chief Internet Evangelist, he has been talking up the Government’s National Broadband Network (NBN) at every opportunity. We have written here before about the NBN project, most recently upon the release of the business plan towards the end of last year. We believe that effective innovation requires the support of suitable infrastructure, and that the NBN will be an important component of that infrastructure in the future. It seems that Vint Cerf shares our views in this regard. I consider this to be a stunning investment in infrastructure that in my view will have very long term benefit. Infrastructure is all about enabling things and I see Australia is trying to enable innovation (with this project). I'm excited by this and hope that it turns into something that is visibly measurable for the Australian economy. I am so envious that you have a government that is willing to make the long term infrastructure investment of this magnitude and of this type [in the NBN]. I will be pushing very hard for similar activities in the US but quite frankly you guys are way ahead of us. Let me start out by saying to you that I hope you all appreciate the stunning impact that your decision to build this broadband system on a national scale is having. … The architecture of the Sydney Opera House has become an icon of Australia. And I have to tell you that this decision — to build the broadband network — is becoming an icon in the IT community. Personally, I envy every single Aussie that is going to benefit from this national scale of investment. It is truly an infrastructure investment that is going to pay off in terms of GDP development, entrepreneurial opportunity and innovation. Cynics will say, of course, that there is nothing surprising in any of this coming from someone employed to promote Google’s interests on the Internet. It is self-evident that the more people connected to the net, at higher speeds, the more potential there is for a company like Google to profit. But this does not make Cerf wrong in his praise or predictions. We doubt that he needs anybody’s money enough to go around saying things that he does not genuinely believe. 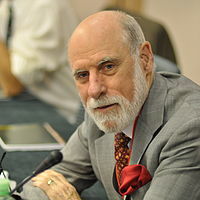 And if anybody should know a thing or too about the potential – and unpredictable – impact of new infrastructure, it is Vint Cerf. We doubt that when he was working on the design of the TCP/IP protocol suite back in the early-to-mid 1970’s he would have envisaged the full scale of its impact upon the world – email, the World Wide Web, Amazon.com, Google, eBay, Facebook, Wikipedia, Second Life, online gaming, BitTorrent, and blogging, to name just a tiny fraction of what the Internet has enabled!